WALTHAM, Mass., Oct. 11, 2018 /PRNewswire/ -- Bentley University has launched a podcast that offers advice to high school students and their parents who are navigating the college search and application process. Admission 101, hosted by Dean of Undergraduate Admission Suzanne Cuccurullo and Director of Undergraduate Admission Mario Silva-Rosa, will identify key application deadlines and share the inside scoop on everything from financial aid and scholarships to college interviews and writing an essay that will stand out. "The college application process can be stressful and overwhelming, particularly managing the requirements and deadlines for each school," says Cuccurullo. "We've dug deep into our experience in college admissions to develop tips that will help students and their parents identify schools that are a match for them and then stick to a schedule that will keep them on time and on target with their applications." 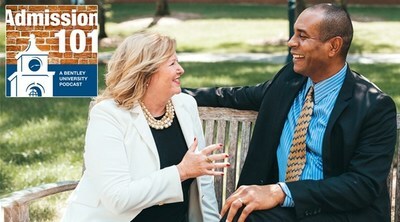 Episodes of the podcast, Admission 101, are available at www.Bentley.edu/undergraduate/admission101. With informative discussions and interviews with Bentley students, Admission 101 offers tips to help high school juniors and seniors and their parents manage the college search from beginning to end and develop personalized to-do lists tostay organized. It also serves as an important resource for high school guidance counselors. "I have the greatest respect for the commitment that prospective students put into fact-finding, applying and ultimately deciding on a college that's right for them," says Silva-Rosa. "The great part about including student guests on the podcast is that they have been through the process — and succeeded." Admission 101 hosts Cuccurullo and Silva-Rosa have reviewed thousands of applications of prospective students from the U.S. and abroad. Admission 101 is Bentley University's second podcast, following the launch of the Counter Offer career-advice podcast that helps people thrive in their careers.